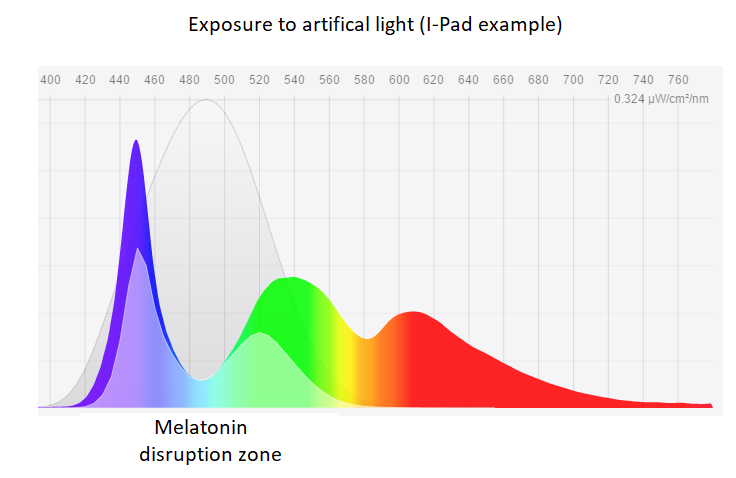 Room lighting in the evening postpones the natural production of the ‘night hormone’ melatonin. A blue light filter on your screens often is not able to prevent this. Only about 80 years ago, people started using artificial light inside of the house. Our biological clock is sensitive to the blue light that it contains. During daytime this isn’t a problem, but at night it keeps us active and alert. Too much artificial light in the evening will shift our circadian rhythm (our 24-hours day-night rhythm) to a later time. Therefore, melatonin will be produced later and it will become harder to wake up in the morning. Moreover, it reduces the amount of deep sleep during the first sleeping cycle. It is scientifically proven that some people are genetically more sensitive to the exposure of blue light in the evening. Are standard blue-blocking computer glasses effective? Many blue light computer glasses are offered nowadays. Many of these glasses only filter five to twenty percent of the blue light. 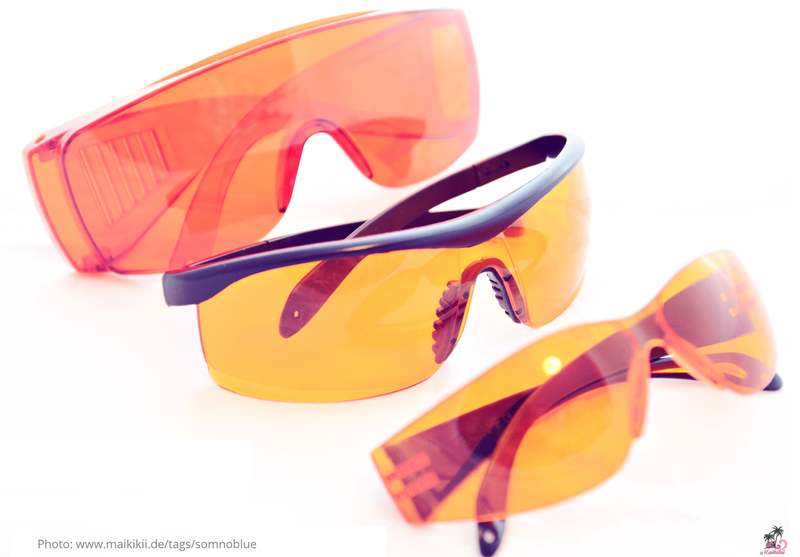 As long as the glasses are yellow or translucent and if they don’t cover the eyes from above, they will allow most of the blue light to reach the eyes. Especially the light that reaches the eyes from above has major effects on our biological clock. Therefore, these products don’t meet a of the criteria of effective sleeping glasses. As the image below shows, blue light with a wave length of 420 to 530 nanometers has the largest effect on our biological clock. 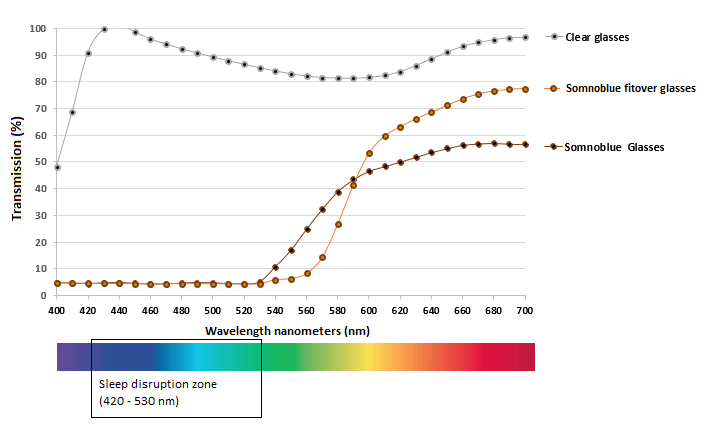 The sleep glasses filter the light with a wave length smaller than 530 nanometers. As a result, you see everything in an orange tint. The absence of blue light is a signal for the brain that night has come. It is important to use electronical devices as little as possible before bedtime, even while using the glasses. It keeps the brains active. Try to relax in the evening, for instance by listening to music or by reading a book. Apart from the exposure to light, there are many other factors which influence your sleep pattern. Amongst others are stress, disturbed sleeping routines or depressions. If your complaints are so heavy that you have sleep deprivation frequently, please contact your general practitioner. In your life you will sleep between 25 and 30 years. Good sleep is essential for your health, mood, and performance. By using artificial light in the evening, people set back their biological clock, resulting in a delay of melatonin production. For these people, it is both harder to fall asleep and to wake up in the morning. Melatonin is a very powerful antioxidant, especially for the brain. It slows down damage to and aging of our brains. If the melatonin level is suppressed for a longer period of time, it may have a negative effect on your health and your sleep. Sleep is essential for our body and mind to function properly. While we sleep, the brain cleanses itself from toxins and waste. Moreover, it supplements itself with glucose – the fuel that allows the brain to work. Sleeping poorly one or two nights already has a disruptive effect on the functioning of our immune system and results in a craving for unhealthy food. Experiencing poor sleep for a prolonged time makes you susceptible to obesity, heart and vascular diseases and diabetes. While we sleep, our brain is provided with extra glucose. This is necessary for concentration, memory, and general performances. One bad night of sleep, for instance of four hours only, or multiple nights of five hours only, prevents the brains to fully recharge. According to Harvard Business Review, sleeping for four hours only for a longer period of time has the same effects on your performance as drinking six beers before going to work. A good night of sleep contributes to a good mood. As you might have experienced yourself, quality of sleep and mood are closely related. Bad or insufficient sleep may create tension, irritability, and stress. In the long-term, it even increases the risk of depressions or anxiety disorders. Start optimizing your sleep, performance, and health! Shechter, Ari, et al. Blocking nocturnal blue light for insomnia: A randomized controlled trial. Journal of psychiatric research96 (2018): 196-202. Reiter, Russel, et al. Mitochondria: Central organelles for melatonin′ s antioxidant and anti-aging actions. Molecules 23.2 (2018): 509.